How did the ancient Egyptians engineer Khufu’s Great Pyramid at Giza so precisely, with none of today’s surveying or tools? Who were the thousands of laborers who raised the stones and how were they housed, fed, and organized? And how did mobilizing this colossal labor force and the resources invested in this monument transform Egypt? 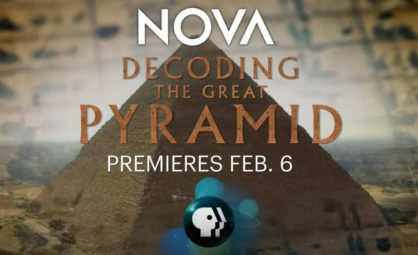 AERA’s Claire Malleson, Glen Dash, Richard Redding, and Mark Lehner join Salima Ikram and Pierre Tallet to discuss the latest research into how the Great Pyramid was built and how building it transformed Egyptian society on a new episode of Nova premiering on PBS on Wednesday, February 6th, at 9pm ET/8pm CT.
Watch the trailer on the Nova website & check your local PBS channel for times.